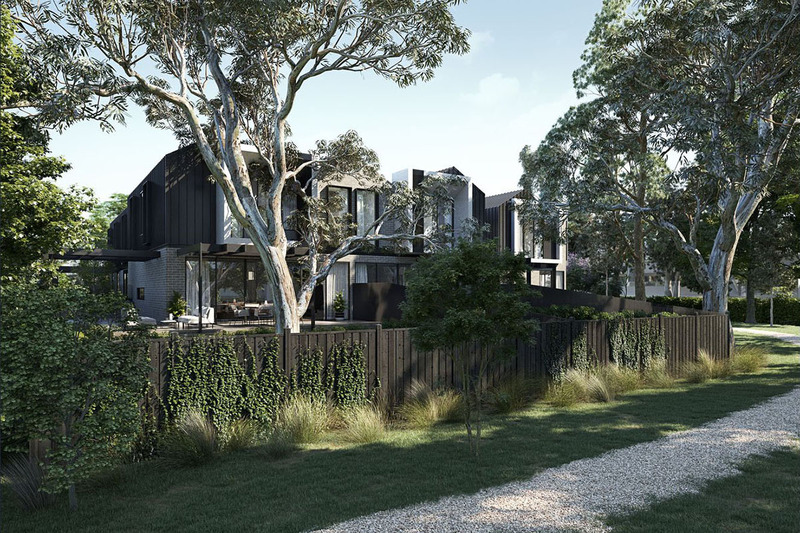 Creating a home which was seen to be floating amongst the established trees at the front of the site was an important part of the brief for this residential project. 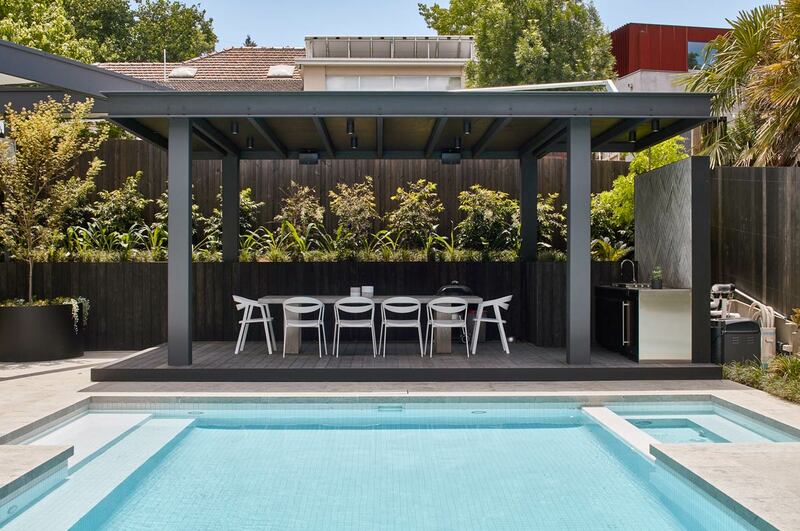 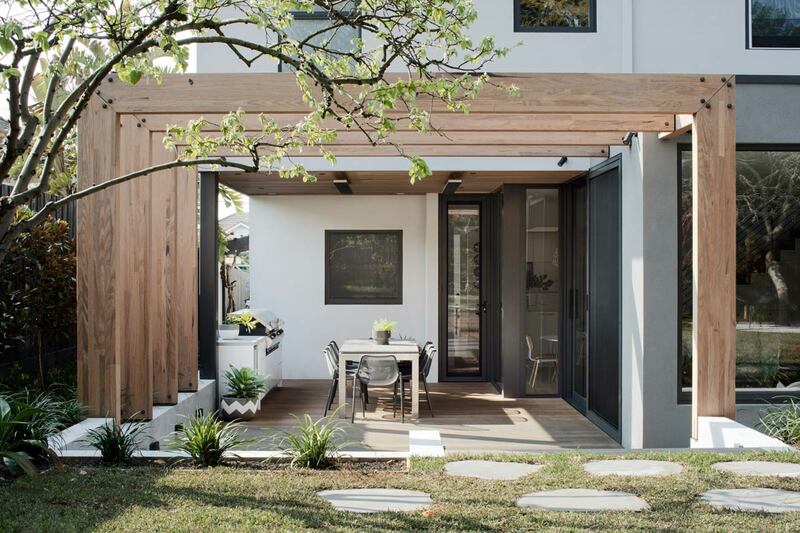 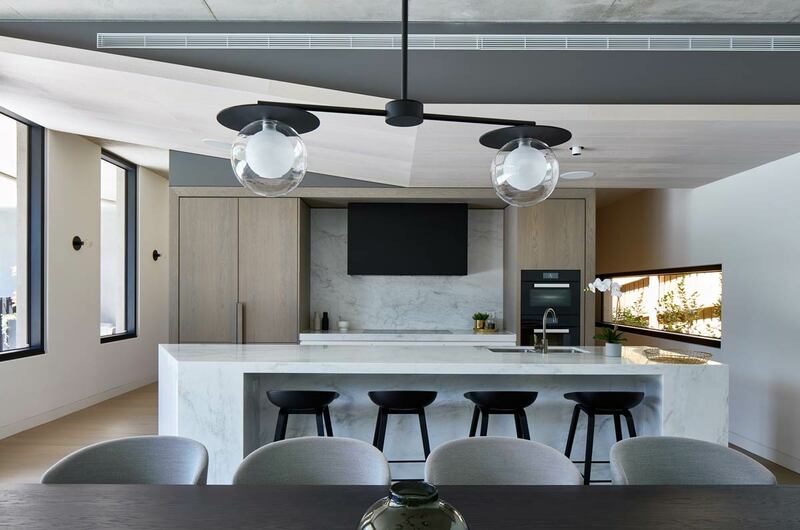 The home needed to complement the landscape within the leafy suburb of East Ivanhoe whilst maintain a high-level of privacy for the occupants. 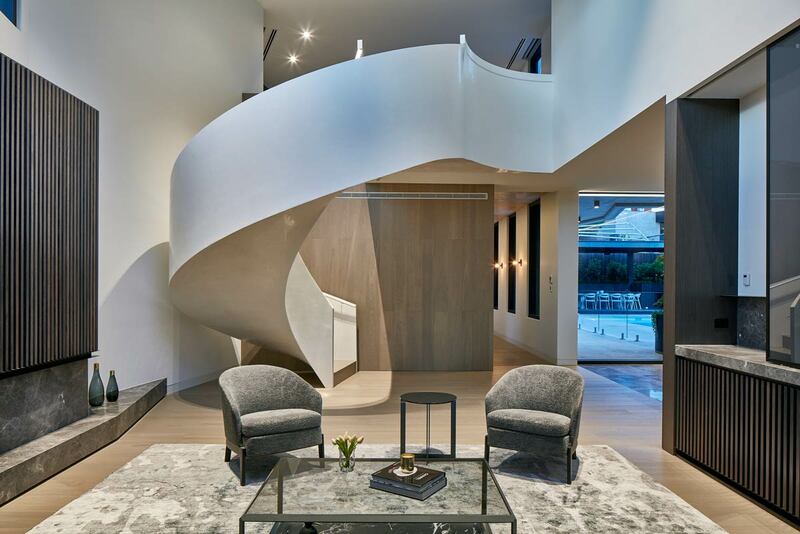 Luxury was the key, with a high-level of interior finish requested. 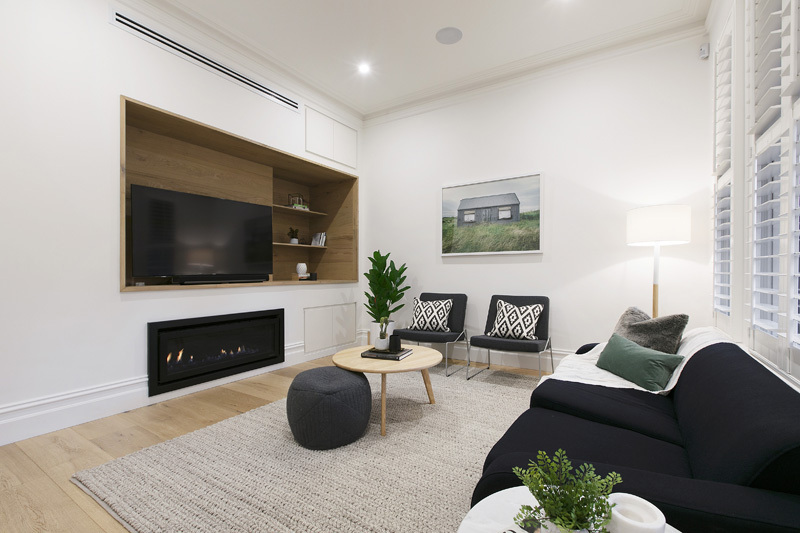 Good entertaining areas were essential, which needed to incorporate adults’ formal spaces as well as separate areas for older children. 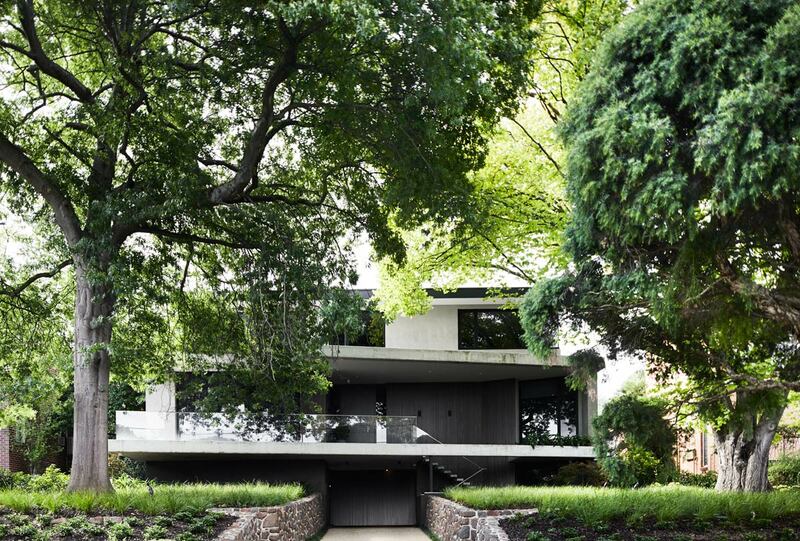 Out of this brief materialised The Ivanhoe House. 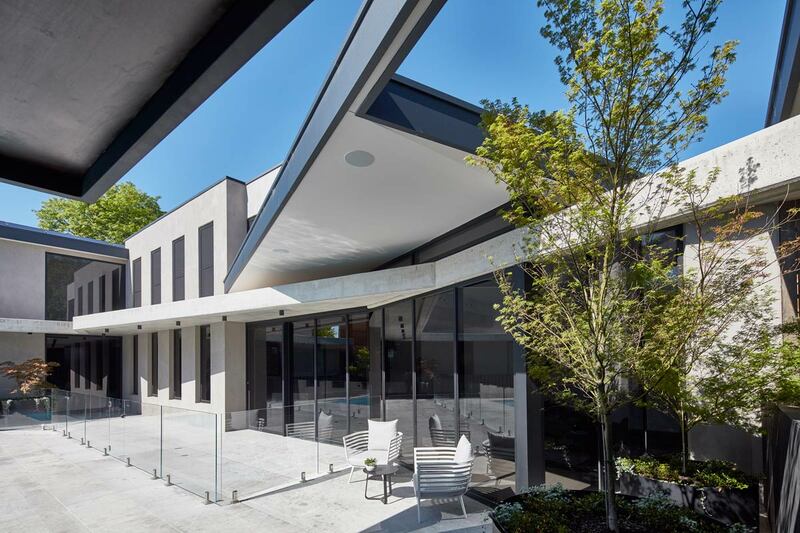 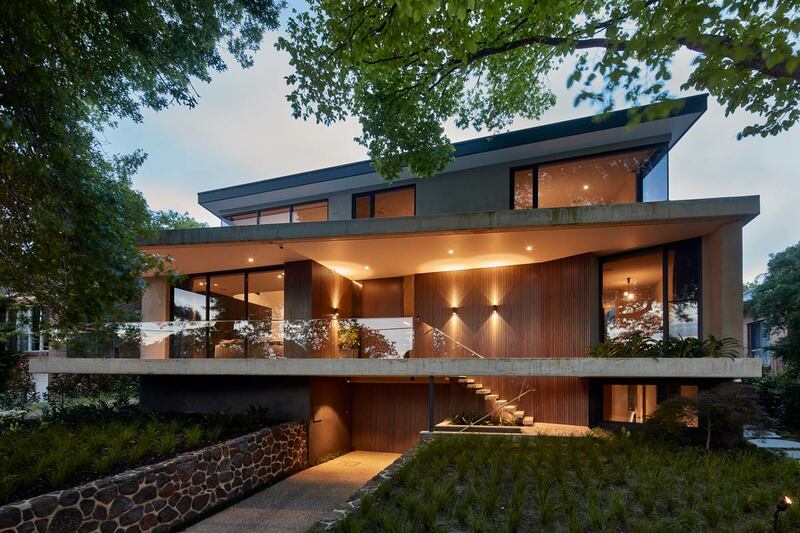 Through an extensive design process we developed an architectural solution which featured a combination of a cantilevered concrete floor and awning structures which expanded views from the interior out into the landscape. 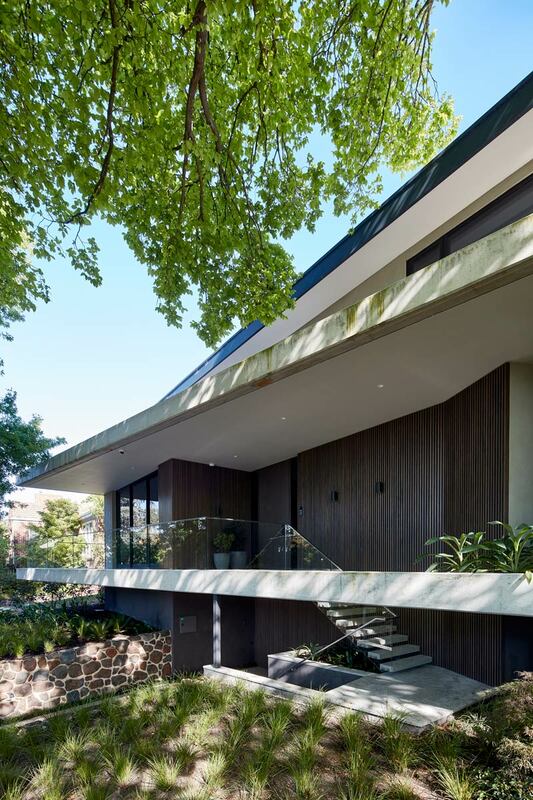 Due to the sloped site, the main entry was raised from the footpath level. 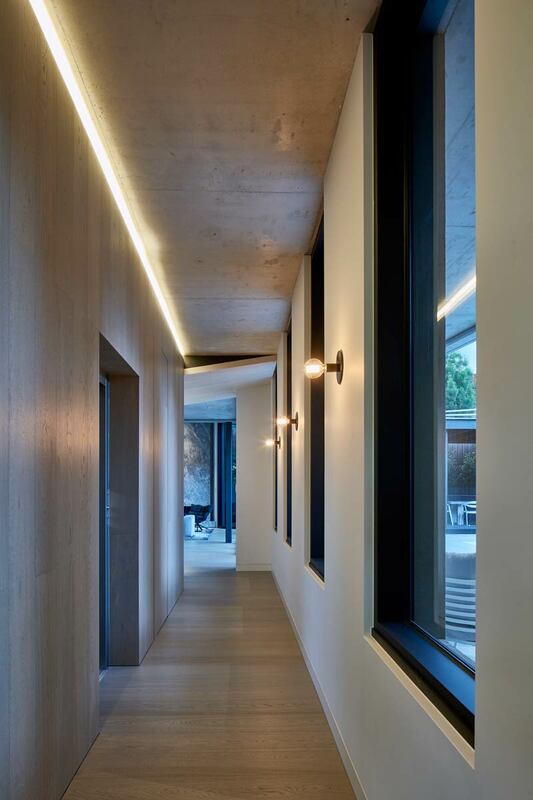 We carefully controlled the access journey to the entry via an external stairwell which was cut into the ground floor projecting concrete floor plate. 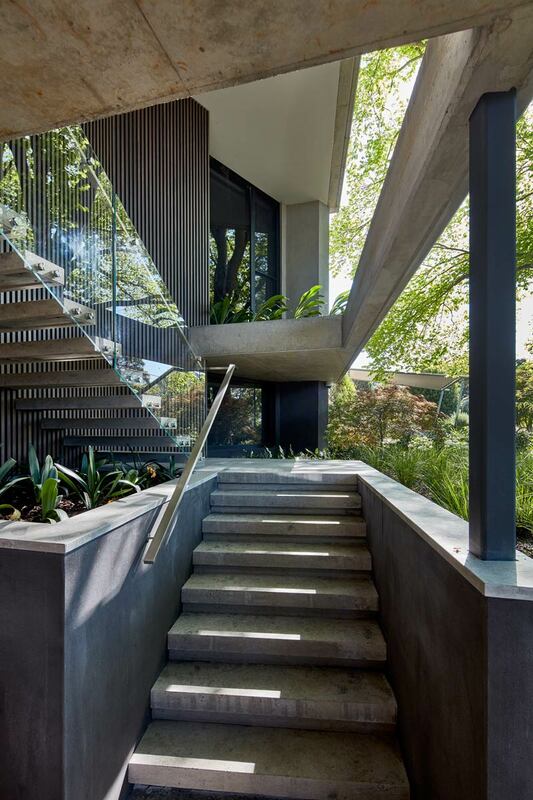 This stair was partially sunk into the garden, and then partly cantilevered out from the building surface. 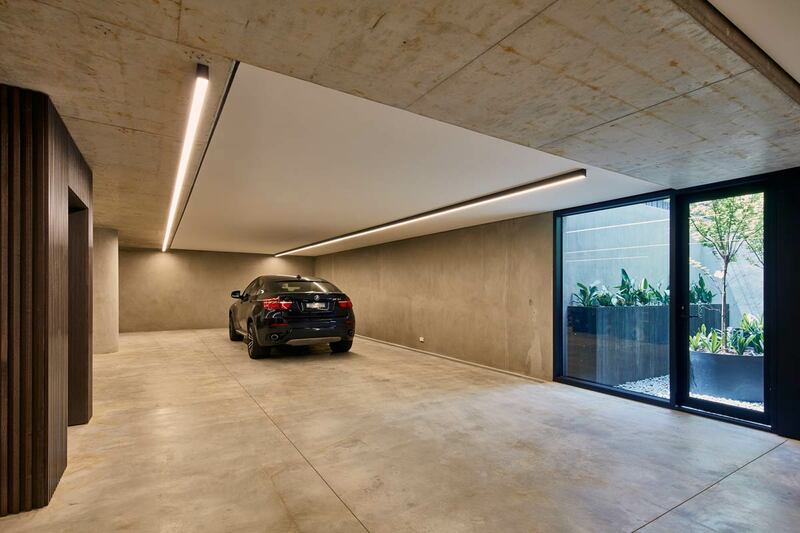 The sloped site allowed for central driveway access into the below ground basement for vehicle storage. 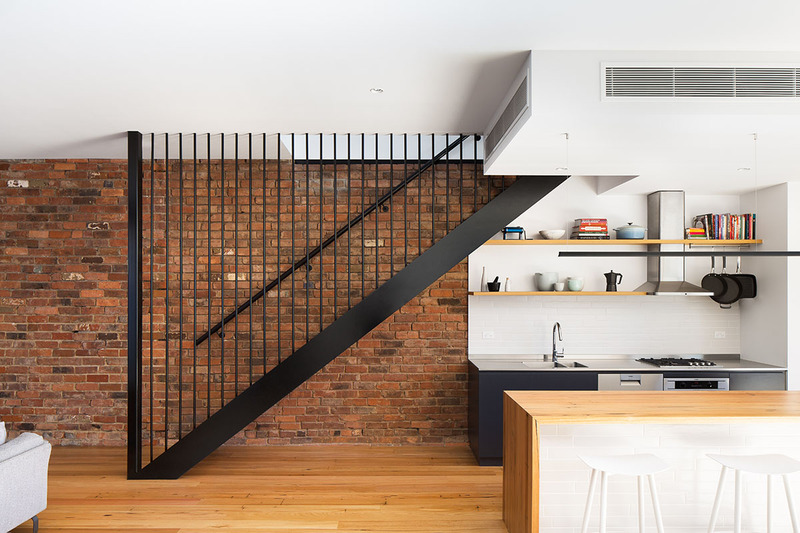 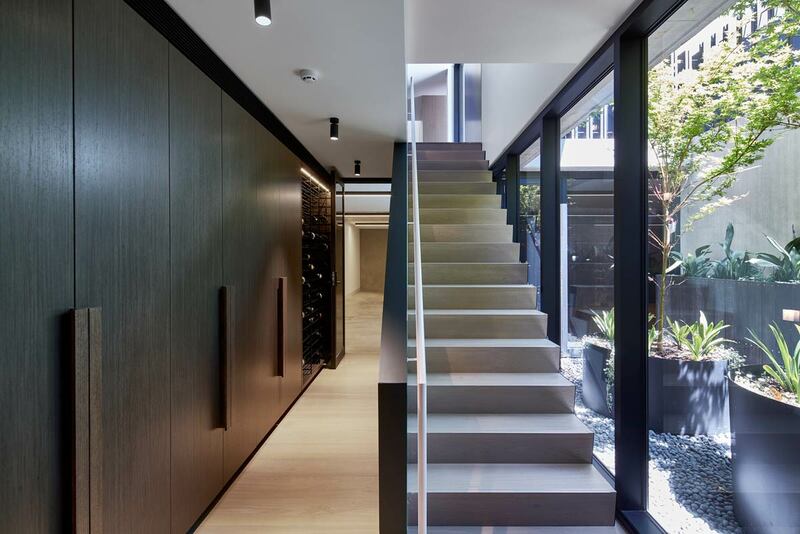 A guest bedroom, storage and a gym was also located on this level. 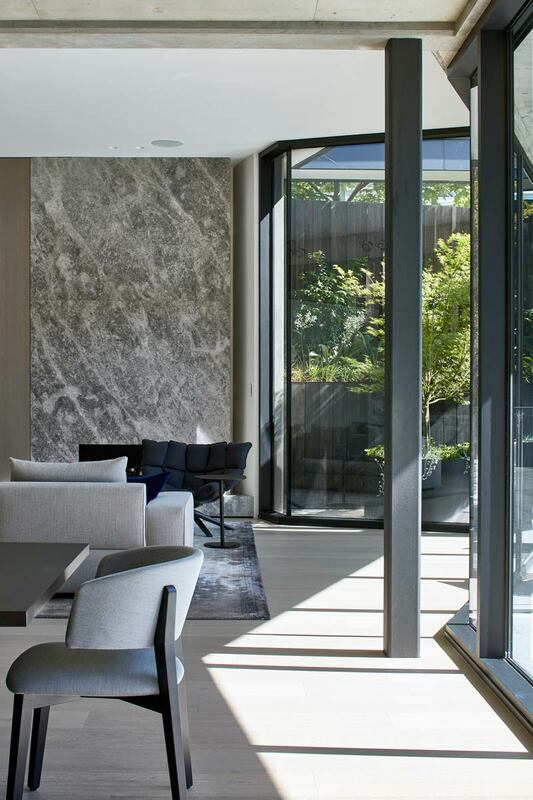 Manipulations of the building form were employed to expand the interiors out into the landscape and setup a conceptual framework where we continued our practices interest in spatial division patterns. 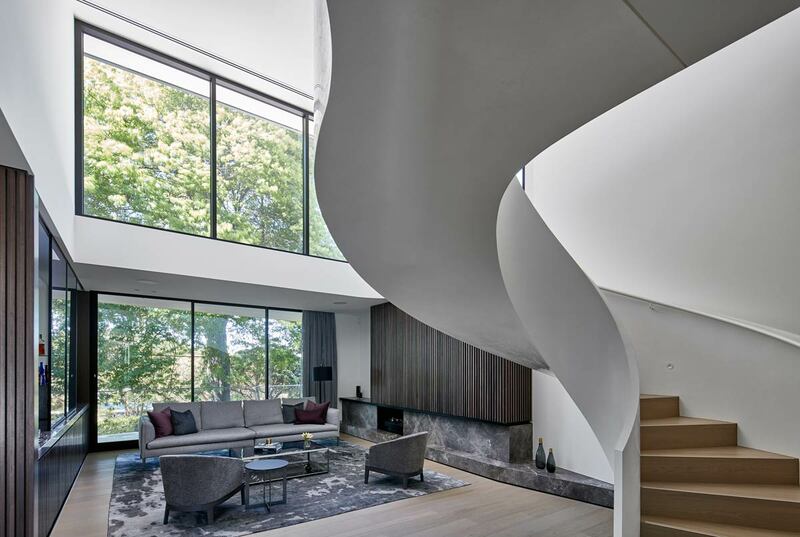 The entry foyer opens onto a formal living area which incorporated; large panel windows, a double height volume, and a feature spiral stairwell which captures views to the two large Pin Oak & Golden Elm trees at the front of the property. 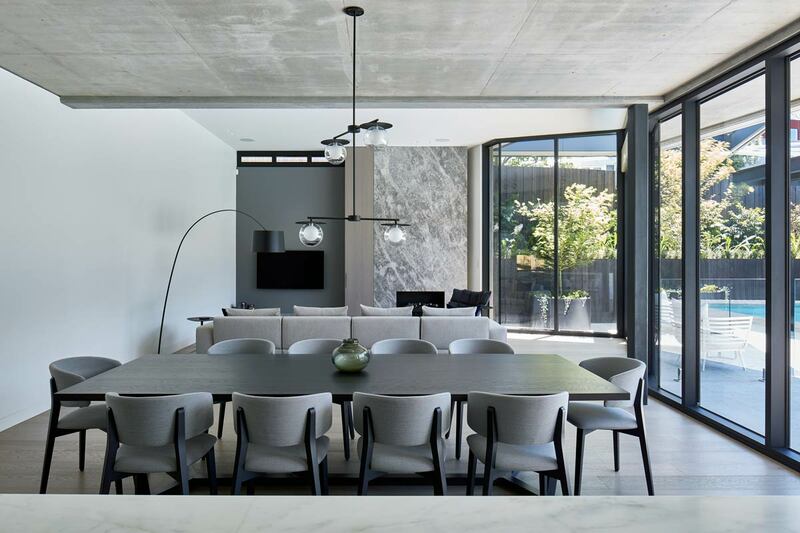 The first floor incorporates cantilevered concrete awnings, and exposed ceilings, which express the building structure and allow for solar protection for the main living area large panel windows. 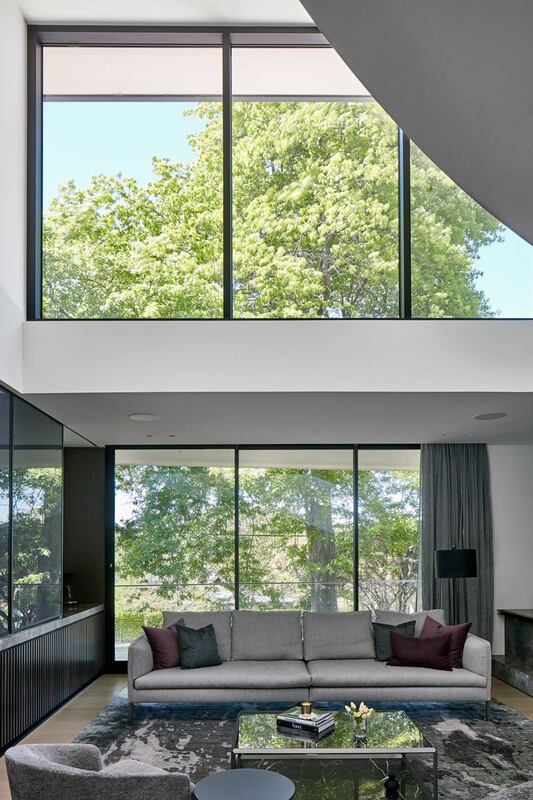 The main living area wrapped around the south west boundary of the site to focus views out to the feature swimming pool and external landscaping. 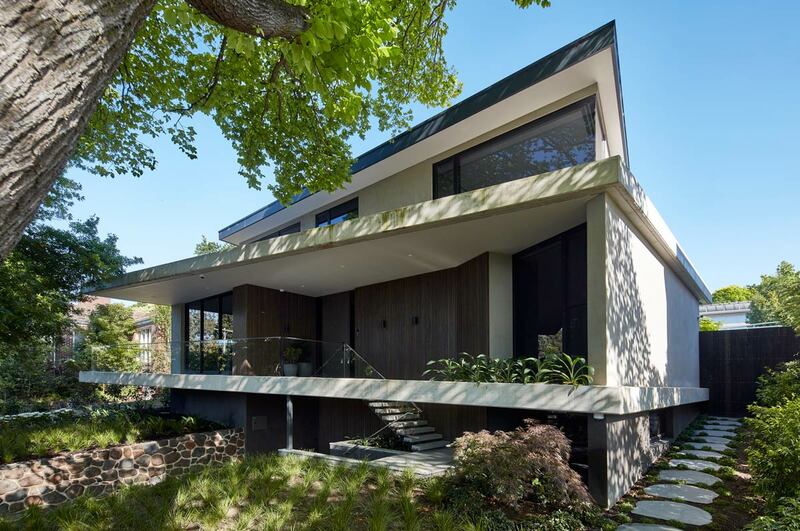 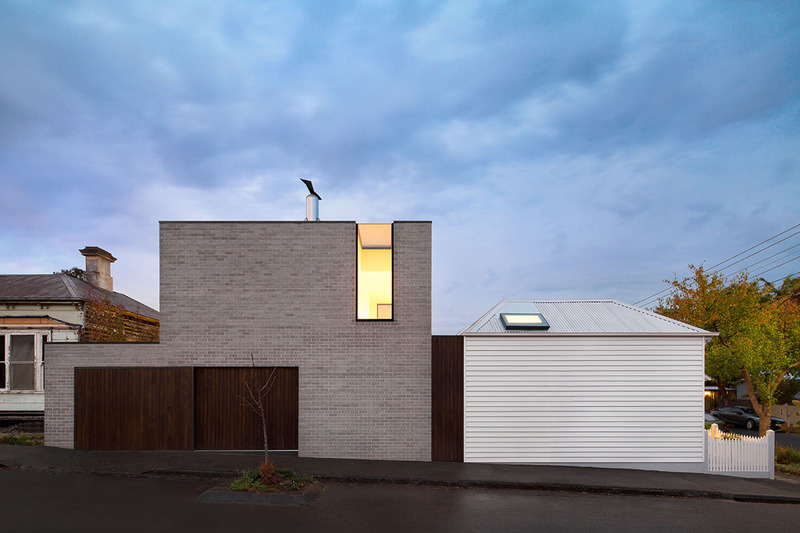 The external materials were selected to pick up on the colours of the immediate landscape; particularly the two large Pin Oak & Golden Elm trees in the front yard, and the leafy suburban streetscape. 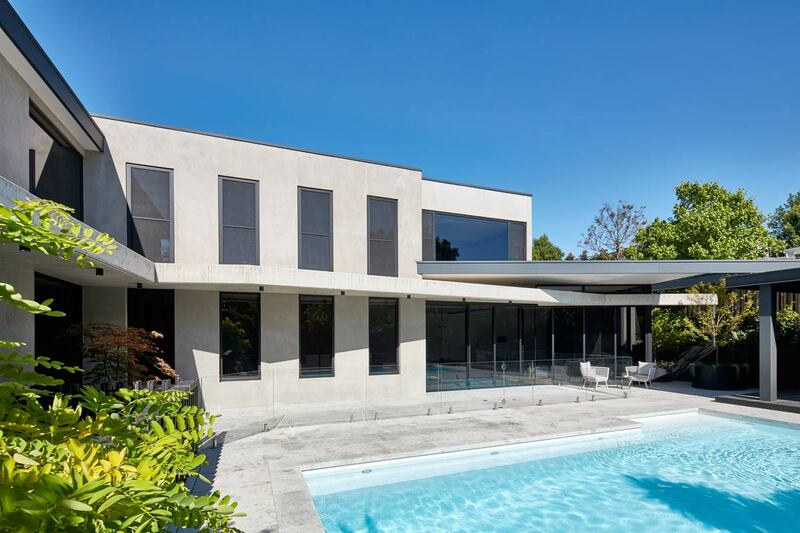 The slightly imperfect off form concrete awnings were complimented with the smoother light grey concrete render finish to vertical surfaces. 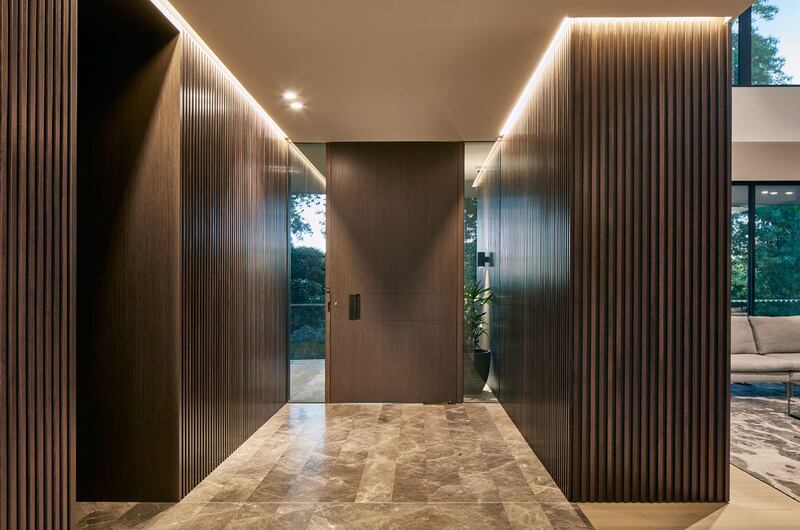 Dark stained timber panelling was been located around main entry and interior foyer to add warmth. 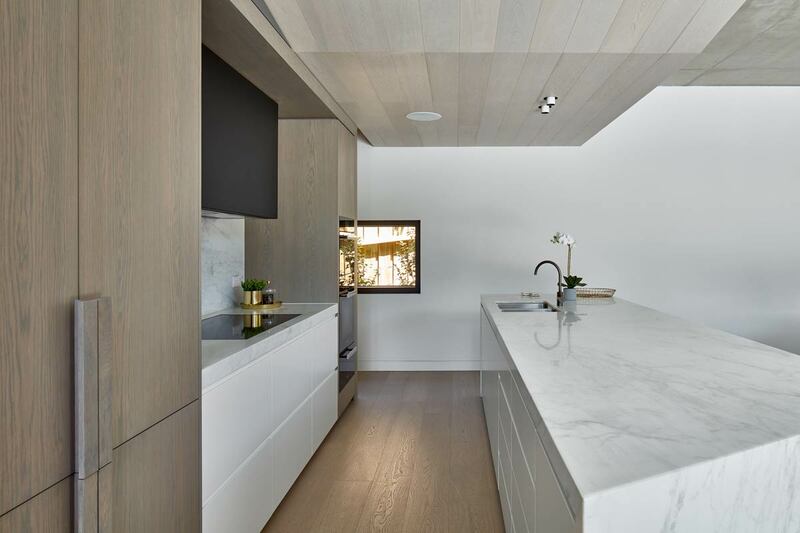 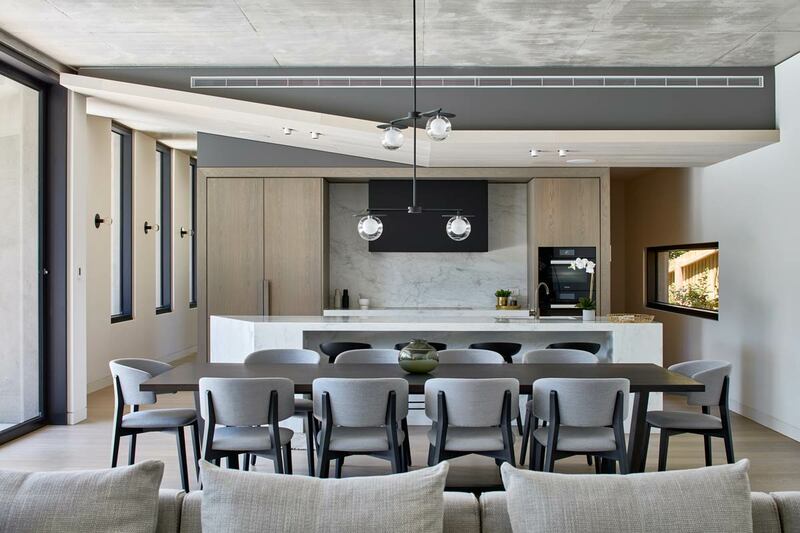 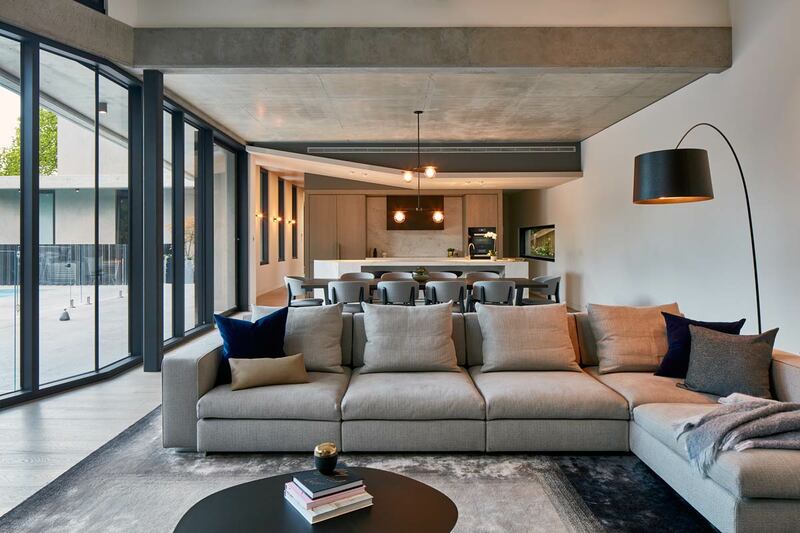 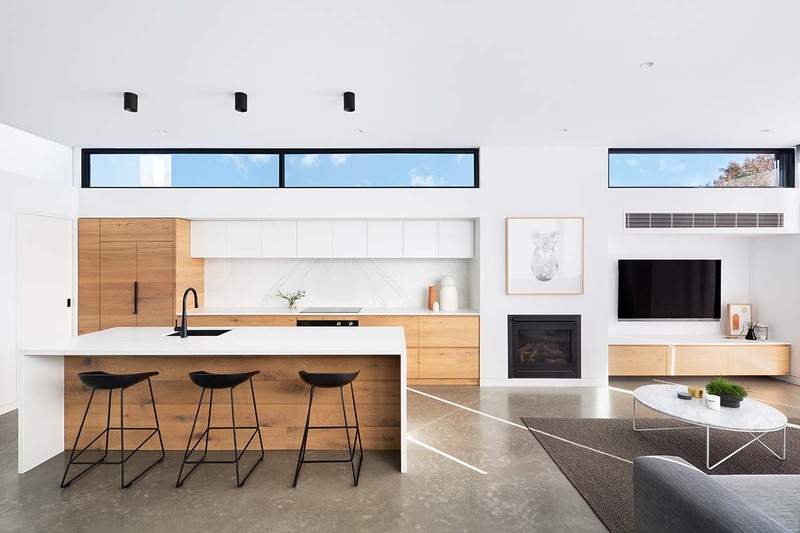 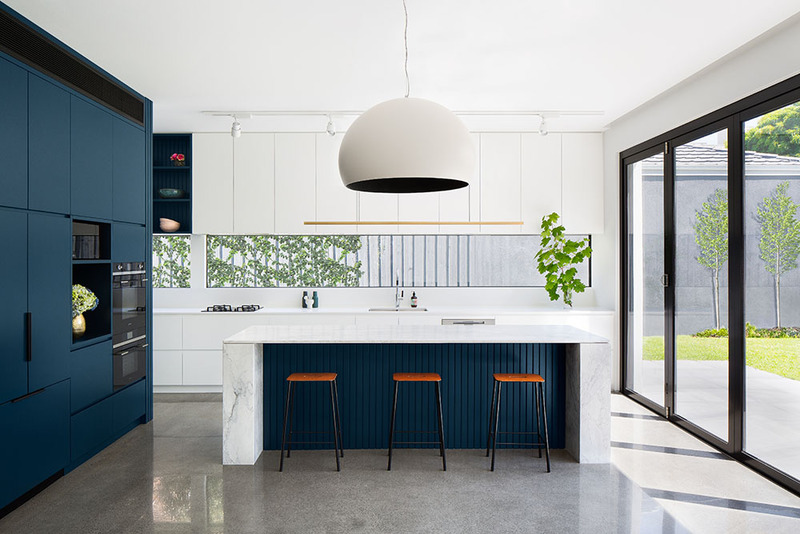 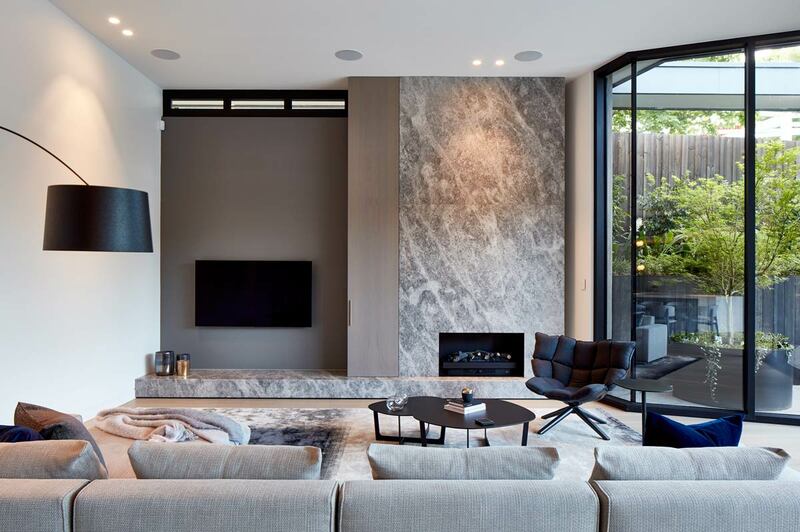 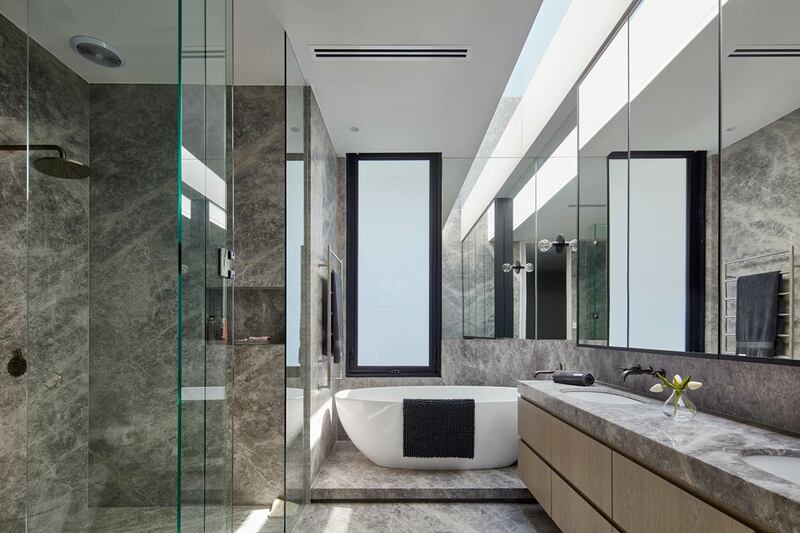 The interior features a palate of white plasterboard, select timber panels, European oak timber flooring, and feature marble textures to add warmth and texture to the interiors. 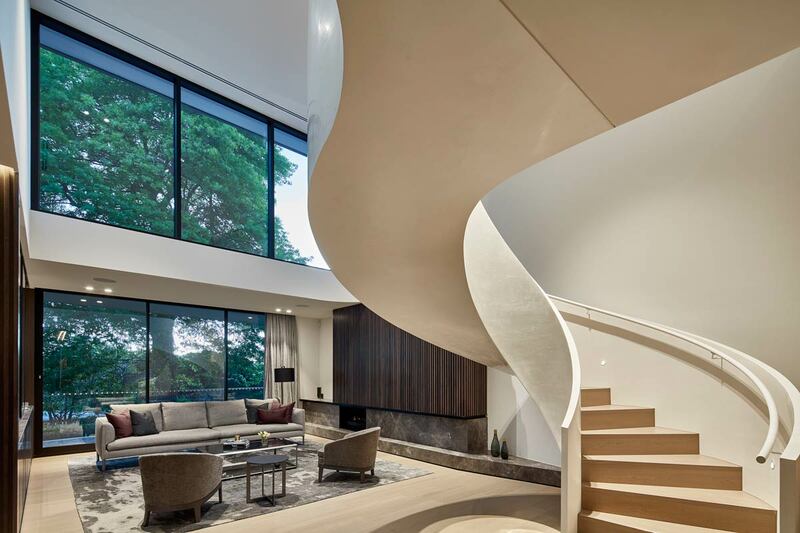 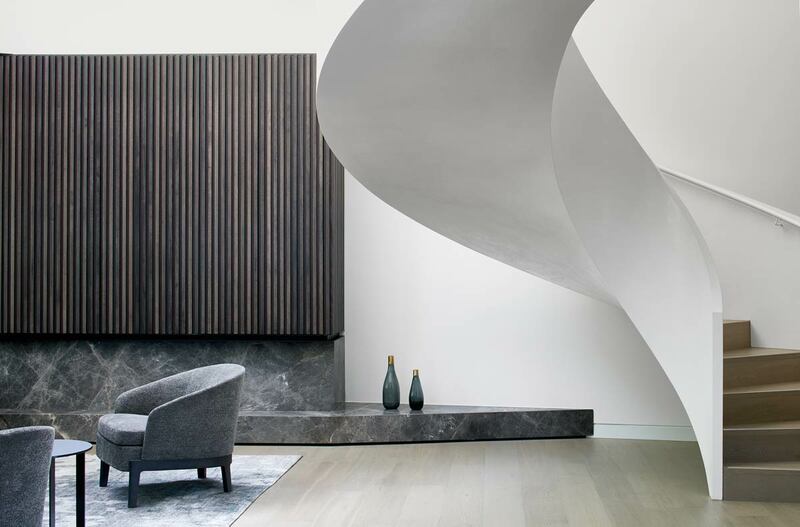 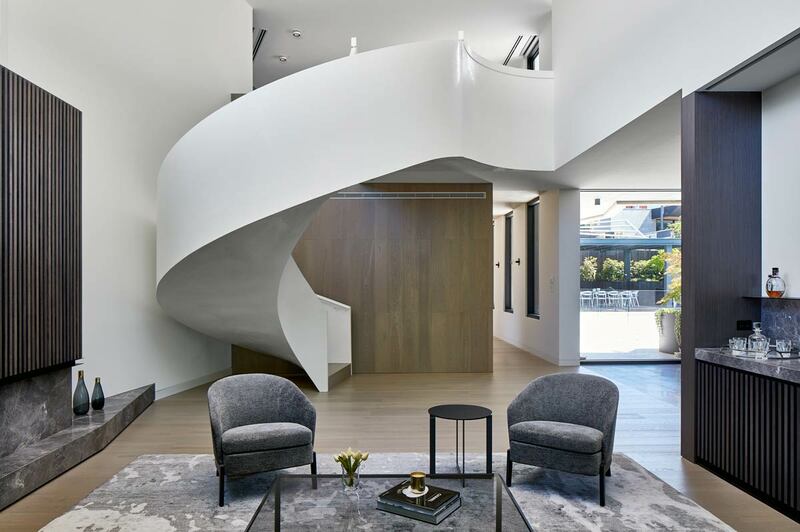 The spiral stairwell was carefully detailed to offset the angled wall and forms of the building structure and curve through the formal living area.